It's been awhile since I cut my hair...a year probably. I get so busy with my life that I don't get a chance to book an appointment and keep it. So I make it a habit to get an appointment when I go visit family to chop my hair off. By now, you're thinking, we all cut our hair, what's so special about this? Why are you even telling us? I'm getting there, kay? I've always had long hair; it went down past the small of my back and every time I go to the hair salon, they refuse to cut my hair shorter than shoulder length because they're worried I'll go into shock if they do. This is where it gets weird...but in a good way! It's almost as if the stars aligned and all these random forces came together, partly because of #BlogHer. You see, I'd been on twitter a LOT, lately...I wouldn't really say a twitter whore but fairly close. 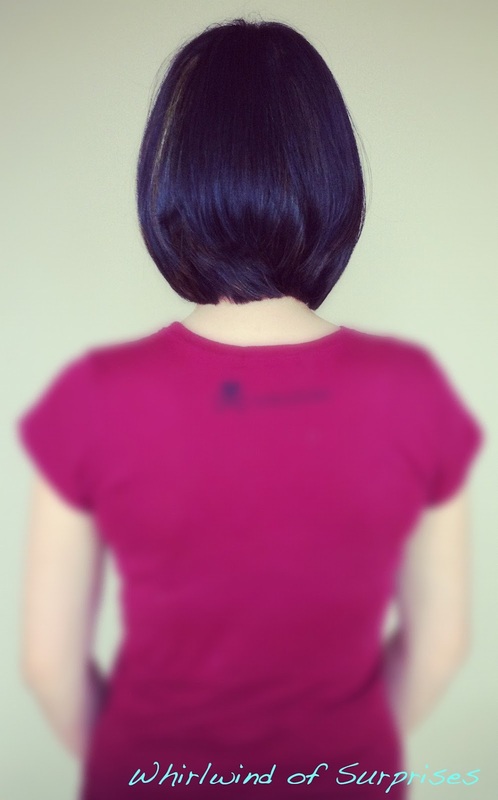 For some reason, I decided to tweet about chopping my long hair off the day before and considering a shorter cut. @SocialSoiree, a fabulous event I'll be attending this summer, tweeted back. They told me about Locks of Love. Then other people tweeted at me and we became a movement, spreading charitable knowledge, love, and care for others. Locks of Love is a charity who collects both hair and money in order to help children who due to their various medical conditions, have lost their hair. 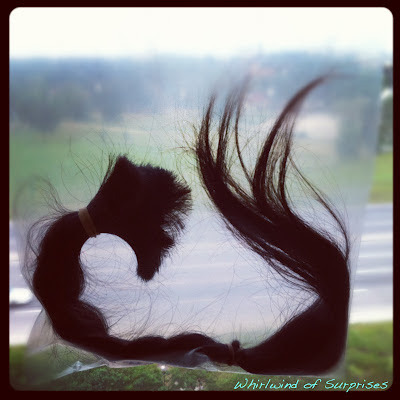 This charity collects donated hair that is of at least 10" long and uses 8-12 donated pieces to make one hair-piece for a child. I thought to myself, "Wow, what a great cause. And this is such a perfect opportunity to help someone out." I definitely had more than 10" to cut off. I ended up cutting of 18-20" of hair to donate before letting the salon fix my hairstyle. Guess what? They had no choice but to give me a cut above my shoulders this time. 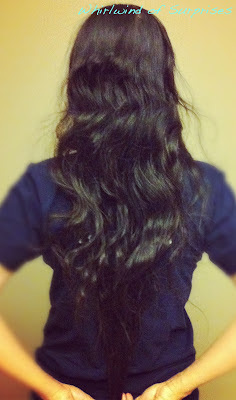 And for the first in a very long time, you can actually kind of see my neck from the back! Ha! I found it amusing that the first words out of my family and friends' mouths were, "So short!" You see, they haven't ever seen me with short hair. My parents may have given me a really short hair cut once when I was a kid. I still haven't quite adjusted to it, but I don't think it looks bad either. More importantly though, I was able to help towards a great cause and I thank those of you on twitter and especially, @SocialSoiree for bringing it to my attention. Next time you need to cut your hair and you have at least 10" you're cutting off, think about donating it to Locks of Love. You're cutting it off anyways, why not do some good while you're at it? Wow, What a fantastic amazing thing you did! I love the look of your new hair! Love your new hair cut and what a great cause! I LOVE hearing stories like this - good on ya and thank you for sharing! As a mom of a little boy just diagnosed with Alopecia Areata, I thank you on behalf of all kids who have need of wigs for your donation. It's awesome. If I find you at BlogHer I may just hug you! I did this after I got married and never had so much more joy! I am so happy to see this post! That is such a great cause. I've had friends who donated to Locks of Love and was always curious about it. Your hair looks great now too by the way! Beautiful hair cut and even more beautiful that it was cut for a cause. What a great cause! That was great of you to do that! :) You just made some little kid's day! Your new cut is adorable! Its awesome that you donated your hair! Love the new cut!!! I did this a few years ago and I don't think I ever missed my super long hair. It's much better shorter! :) See ya at BlogHer!!! Oh my goodness. That I's soooo dramatic and lovely. What a great thing you did! !